Tonight marks Bullet For My Valentine’s first show in the home of metal in over two years. Since then they have dominated the music world; selling out arenas and seeing millions of their albums fly off the shelves. And this Birmingham crowd can hardly wait for them to dominate the stage once again. Miss May I get the party started. The American metallers take to the stage in a ball of energy and fiercely power through hard-hitters such as ‘Forgive and Forget’ and the aptly title, ‘Relentless Chaos’, before immersing the crowd in a brilliant rendition of ‘Masses Of A Dying Breed’. 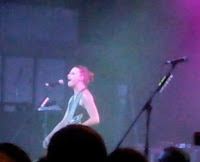 Their time is short but frenzied and certainly starts the night off right, while the recent Grammy award winners, Halestorm bring a little attitude into the fray. With fan-favourites, such as the award-winning, ‘Love Bites (And So Do I) and the catchy ‘I get Off’, Lzzy Hale displays her powerful vocals, as the band tears through their set and doesn’t let up for one second. The anthems ‘Freak Like Me’ and ‘Rock Show’ get the crowd going and show off the band’s amazing talents onstage. 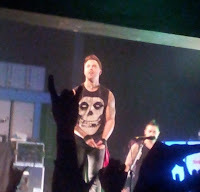 But it’s the main attraction, Bullet For My Valentine, who impress the most. By the time they’ve opened with the anger-filled ‘Breaking Point’, it’s already evident that they’ve matured a lot as live band over the last few years. In fact, it’s evident even before that, as the Welsh boys make sure to give the crowd a little ‘O Fortuna’ and Queen’s ‘We Will Rock You’, before taking to the stage, making for a fresh and different kind of entrance. Not afraid to get creative and shake things up, a stripped-down rendition of the thought-provoking ’The Fight’, sees frontman Matt Tuck soothe the crowd with nothing but his voice and an acoustic guitar, before the rest of the band joins in, turning the song into another mosh-pit starter. The more recent ‘Dirty Little Secret’ makes it’s live debut on British shores and includes Halestorm’s Lzzy Hale’s return to the stage, as she joins the band to sing a duo. Her presence brings a deeper meaning to the song, as her and Matt Tuck’s voices complement each other brilliantly. It all makes for a very exciting live Bullet show. Playing songs both new and old, the band bring all the most-loved anthems out. ‘4 Words (To Choke Upon)’ and ‘Waking The Demon’ bring the house down with their infectious ferocity, while the slower ‘Tears Don’t’ Fall’ makes sure that long-time fans go home happy. It’s a song the band have been playing live for many years now, but it’s one still delivered with the same passion and vigour as ever, as is ‘Her Voice Resides’; making its live return after a seven year hiatus, it still packs a punch to this day and proves to be a perfect head-banger. The title track to the band’s new album, ‘Temper, Temper’ is an upbeat one, that gives off that party vibe definitely felt by the mosh-pit, while the powerful ‘POW’ makes for a slower and, at the same time, aggressive track to get the crowd to sing along, as does the heavier ‘Scream Aim Fire’. This huge heavyweight of a song turns the volume up and keeps it there, a wild crowd loving every minute. Tonight shows just why Bullet is considered the biggest British metal band in recent memory; their talent and enthusiasm evident throughout and what better place to do this, than in the home of metal?